I don’t normally write about men’s tennis, but sometimes there are things happening on the men’s side that impact the women’s game. Most of the time it is about the issue of equal prize money, which often reflects the sexism and misogyny that permeate tennis coverage by men who grew up in an era when men dominated in professional tennis and the women’s game was an afterthought. Unless you were living under a rock the recent exposing of white supremacist beliefs espoused by some male American tennis players has found its way into women’s tennis. Ever since the election of Donald Trump as President, some tennis fans, who have long held the view that most of the white men that play professional tennis are racists and misogynists, have had their concerns confirmed by the writings and commentary espoused via social media by John Isner, Ryan Harrison and now Tennys Sandgren. Someone needs to tell Mr. Sandgren that when you come for Serena, you basically take on all of tennis. I will not use this medium to defend Ms. Serena Jameka Williams, first of her name, because goodness me the woman is quite capable of doing that all on her own as she has been doing all her life. As a case in point, Mr. Sandgren chose to issue a general apology today and Ms. Williams responded https://platform.twitter.com/widgets.js“>in kind. What I wish to address is the clear lack of PR training that seems to go on in men’s tennis. Gone apparently are the days when media training seemed to be an essential tool in selling men’s tennis. Today, you find all kinds of views being espoused by all and sundry. It used to be that one would only know a racist by their behaviour, but through social media these men openly declare their racist, homophobic, and sexist views through their interactions with those holding such views. It has become another space for players to reveal themselves. This morning (24 January), John Isner labelled people who cite racism, sexism and homophobia as victims. This is the same John Isner who felt betrayed because people in New York City chose to cheer for Frenchman Gael Monfils in a match against him. To compound that issue, his good friend, Mr. Sandgren felt the need to declare that New York City, the greatest City (apart from Kingston, Jamaica) that was ever built, probably should not have the privilege of hosting a Grand Slam event. Who is the victim in this scenario? The world has been watching what has been happening in the United States, a country previously defined by its generosity of spirit as it welcomed people with open arms, begin to close its borders. Men, ugly inside and outside, whose families have benefitted from the largesse of immigrants from countries who helped to build that great nation are suddenly making policies that benefit only people of a certain colour. Tennys Sandgren traces his roots back to South Africa, a country so steeped in apartheid and racial segregation that once the back of that oppressive regime was broken, most white people who still believed that black people were inferior to white people and that apartheid was God given made their way to places like the United States, Canada, and England. I can tell you first hand that some have tried to make their home in the Caribbean, but without success. These people espouse a doctrine and a belief that is an anathema to social equality. Yet, they have found comfort in espousing these views in certain corners. While many who cover tennis continues to make excuses for Tennys Sandgren, citing his age etc (hello Nick Kyrgios), they are also revealing their feelings about equality. It is important for all of us to listen very keenly to the excuses that are being made about Mr. Sandgren and his social media leanings. It is important for us to listen very keenly as journalists try to construct a narrative of excuses for a young man who clearly grew up in a home that lacked diversity and an understanding of its value. We need to take note as they defend a man who felt it was ok to denigrate minorities on a social media platform and then retreat into talks about his Christian beliefs and about following Jesus’ teachings when his beliefs were challenged. Well, Mr. Sandgren, let me tell you about Jesus, because I am also a Christian. I am not just a warmer of benches on Sundays, but I follow the teachings of Christ to the letter. The Jesus that I know and love and which many people, including Serena Williams, know and love were taught to love everybody, no matter their race, gender, sexual orientation or country of origin. We love all equitably. If you wish to know that Jesus, you are welcome to come to my church and join us so that you too can know this Jesus. I missed last night’s match with Simona Halep and Karolina Pliskova but I intend to watch it today. I have no idea what happened but I am sure that Karolina Pliskova and her coach are also wondering what happened. In the other quarter final, Angelique Kerber seems to be finding her groove. Madison Keys had no answer, but it was good to see her smiling even during her loss. It can’t have been a happy outing for her. Caroline Wozniacki suffered another scare when it took her 3 sets to take out Carla Suarez-Navarro and Elise Mertens absolutely demolished Elina Svitolina. Svitolina has cited a hip injury for her loss, but we all know that even if she didn’t have that hip injury she was being outplayed from every part of the court. A good hip would not have saved her. I will be back later today with my semifinal write up and Spin’s Picks. I never like to write about players who seen hell bent on trying to change the narrative of their careers. Whether it is trying to get to the top ranking, trying to break into the elite of elites and win a Major or even the simple act of trying to break into the top 10. I have always maintained that players already have it hard with the pressure that they place on themselves that they don’t need armchair pundits like myself adding to the pressure. I have tried not to talk or write about Wozniacki because she does seem to be on a mission. 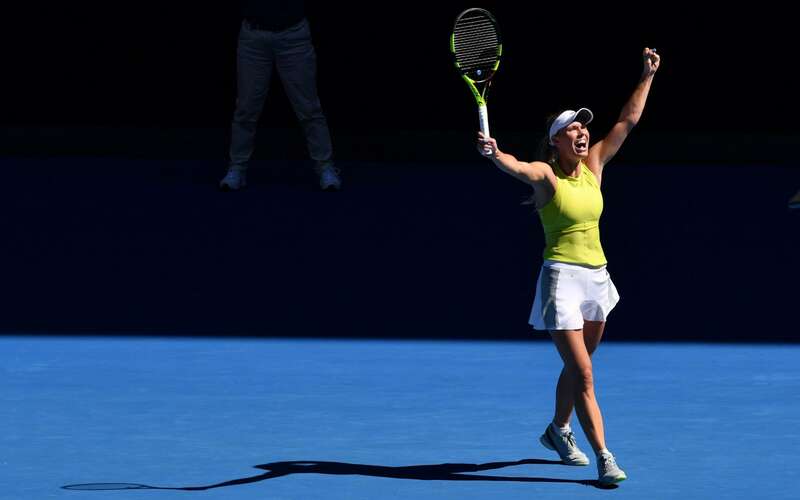 Whether that mission is to claw her way back to the top of women’s tennis or whether it is trying to win that elusive Major, Wozniacki has been hitting the ball as well or even better than when she was the top ranked woman in women’s tennis. Don’t get me wrong her ability to play long grueling rallies during matches is still there but she is much more forceful on her forehand side and her serve which while good has never been outstanding has gotten even better. It would seem that with all the coaching changes that Team Wozniacki has experienced over the years they have taken a little bit of all those coaches to build a better tennis player. Wozniacki has now become Frankenwoz. Last night she was hitting from everywhere on the court with a 6-3, 6-0 drubbing of Rybarikova. Her performance puts her into the quarterfinals of the Australian Open. The first time she has reached this round since 2011 when she made the semifinals. With her performance last night picking against Wozniacki might not be the best thing to do right now. 61, 6-3 and it wasn’t even that close. I got up this morning and saw the scoreline and thought to myself, well at least the second set was relatively competitive, except it really wasn’t. I did want to mention that ever since Sharapova returned from her doping suspension, she has looked slow, unsure around the court and not as fired up as she was pre-meldonium ban. Without a doubt Kerber has improved this season, but Sharapova, title notwithstanding this year is a shadow of her former self. Caught behind the baseline for much of the match, Sharapova kept lunging after balls and there seems to be no improvement whatsoever to her game. She still can’t hit a traditional volley and while before she was known as the queen of 3 sets, now she appears exhausted after a straight sets match. As someone opined elsewhere the fear factor, if there was ever one in the locker room no longer exists. However, the match of the day was the 2 hour and 45 minute wonder that was the third set of Halep/Davis. Who knew that 2 players who barely scrape 5 ft, 6 could make an entire stadium rise to its feet in appreciation. After 3 hours, Lauren Davis held 3 consecutive match points on the Simona Halep serve. She failed to take any of them. Simona Halep by extension had to serve for the match 4 times before finally earning her first match point. There was a medical time out drama (broken toenail), heat exhaustion, mental issues, but both women kept going and going and going. After listening to Pam Shriver bemoan the many breaks of serve in women’s matches, it was a bit of karmic justice that one of the best matches of this year’s Australian Open featured a match where neither player had a big serve, and neither player was able to serve out a match until Halep through sheer willpower managed to do so. I was late for church this morning as I ended up watching my new favourite player, Su Wei Hseih do her thing. In her match this morning against Radwanska, Hseih took control of the match from first to last ball. I don’t know what is going on with Radwanska but her body appears to be broken. In most if not of all her matches so far this year she has had to call the trainer to treat some injury or other. I dubbed her match against Hseih Ninja v. Ninja, but it was like bringing a knife to a gunfight. Just no competition. Naomi Osaka with a new coach and looking fitter and leaner than I have ever seen her shut down the crowd on Margaret Court Arena by taking out Australia’s last female hope in singles in straight sets. She served well but returned even better. Her shot selection was on point and her attitude on court was sublime. One of the more popular pieces that I have ever written for this blog is a how to guide about covering women’s tennis. I am linking it again as a reminder to commentators and sports journalists alike that women’s tennis is not the forgotten stepchild of tennis, but is a professional endeavour undertaken in the same rigorous manner like the men. It is not to be ridiculed and frankly, it is not an aside or prelude to the main event, i.e. a men’s match. Last night there were some matches that were so entertaining that for a minute I wondered at the lack of tennis enthusiasts, commentators and journalists providing play by play commentary via social media. The first match on Rod Laver Arena featured qualifier Luksika Kumkhum and comeback queen Petra Martic. It was a match with its ups and downs, but the shotmaking was absolutely incredible. It is true that the match was slow going at first, but once Kumkhum took the second set, we all knew we would be in for the ride of our lives in the third set. Kumkhum played exceptionally well, so much so that at one point she had the fans in the stands on their feet with her athleticism, especially in the forecourt. During that match there was such a dearth of commentary on social media, I wondered whether I was the only person watching it. What made the match so exceptionally good was the fact that it was really hot, but you would never know it, apart from each player taking a little bit of time in the shade. Neither player made the heat an issue. Meanwhile, there was a men’s match being played at the same time, and from what I saw on social media, neither man was able to contend with the heat. One sports journalist suggested the quality of play was poor as the men were just trying to survive. Another match that provided great entertainment and is the focus of my commentary today is the match between Jelena Ostapenko and Annett Kontaveit. At the tail end of the first set, that doyen of women’s tennis, Pam Shriver spoke about the many breaks of serve in the women’s match, while comparing the fact that the men’s match only had 3 breaks of serve over 3 sets. The inference to be drawn is that the men’s game either had better serves or the quality of play was much better than the women’s match. Nothing could be further from the truth. Breaking your opponent’s serve is a part of the sport of tennis. You can’t win a tennis match if you don’t break serve, whether it is during a set or even during a tiebreak. At some point you have to lose serve. Why breaking serve is misinterpreted as a defect in the women’s game is beyond my comprehension. Therein lies the rub for me. If commentators influence how people, who are scrolling through channels, view the women’s game, then the WTA is going to be hard pressed to build momentum for its sport. Rather than talking about the inability of the women to hold serve, how about we talk about the competitiveness of matches? Why cast a feature if the game in such a negative light? Another narrative that has raised its head is how many women have the ability to leave the Australian Open wearing the No. 1 crown. Rather than spinning it as instability at the top, how about framing it as an indication of the depth of talent on the women’s tour? Would we rather see a Tour that increasingly relies on the fortunes of 2 players (Federer/Nadal) to gain large tv audiences, or would we rather have a Tour that has a slate of multiple players pushing each other forward. Once Federer and Nadal have left the men’s Tour (and yes hard to believe but they will eventually retire), the men’s Tour will be left with a group of men who will most likely jockey for position each week, even if some are devoid of personality and have already earned the ire of tennis journalists everywhere. Will we suddenly see a valuing of having a chase for number 1 among more than two players? We have to move away from using the men’s game as a measuring stick for the women. The women’s game can be measured based upon its own merits, which may very well include the fact that women are capable of breaking each other’s serve. Would we rather see a Tour that increasingly relies on the fortunes of 2 players (Federer/Nadal) to gain large tv audiences, or would we rather have a Tour that has some amount of stability to take it forward. Once Federer and Nadal have left the men’s Tour (and yes hard to believe but they will eventually retire), the men’s Tour will be left with some men who are devoid of personality and who have already earned the ire of tennis journalists everywhere. One of the reasons why I cover the Slams moreso than regular WTA tournaments is because at the Slams you will see players that you normally never get to see during regular WTA events. Part of the problem is that the WTA product is not on tv on a regular basis, but part of it is that sometimes you just don’t have the time to watch many tennis matches. The Majors allow you the opportunity to either watch matches when you get home in the evenings (the Australian Open) or in the early mornings (French Open/Wimbledon) before you leave for work. In addition, the Slams provide wall to wall coverage, with many courts being covered. As a result of that I got to see a player who I have only ever thought of as a doubles specialist, play tennis in a way that in my view is under appreciated. Su Wei Hseih is relatively small compared to other players. I think she stands about 5 feet, 2 inches and probably weighs about 100 pounds soaking wet. She has no name brand clothes, and her tennis is for want of a better word unusual. Last night in a match played on Rod Laver Arean, Hseih took apart the game of a 2 time Slam champion in Garbine Muguruza. I know that when most tennis writers talk about that match they will inevitably pull the Muguruza was injured card, but for me watching that match, Garbine was simply out played. Hseih used Muguruza’s power and athleticism against her. She redirected the ball every chance she got and she got Muguruza moving. Not afraid of the net herself, Hseih came in when the opporutnity presented itself and on the rare occassions when she was caught in long baseline rallies, she stepped up and hit cross court backhand winners that left Muguruza flat footed. It was a fantastic match and shows everyone that you can win tennis matches if you employ guile and a deft touch. Another player who did that last night was Aga Radwanska. In a match that she should have lost, Radwanska used all her considerable guile to outplay Lesia Tsurennko. It was a very disappointing end to the tournament for Tsurenko who actually served for the match and failed to get it over the line. I have not yet had a chance to see the replay of the Barty/Giorgi match but it seems as if the player with the more nuanced game won. Hopefully Giorgi will not be too disappointed and will continue to improve. As I write I am currently watching a replay of Halep/Bouchard and play and I will update this post. I have been watching, as has everyone with a social media handle and television set the rise of the MeToo and TimesUp movement. The movement has been happening in journalism, entertainment, movies and now it has found its way into sport, most notably in women’s gymnastics. Larry Nasser the doctor who treated female gymnasts at the USA Gymnastic facility has been convicted of numerous counts of sexual assault. He is currently awaiting sentencing. Currently we are hearing and reading about his victims as they take the stand at his sentence hearing to give their Victim Impact Statements. The stories these women are telling are chilling, but it reminds me about tennis’ own MeToo and TimesUp movement that happened not too long ago. It started with allegations against a Hall of Famer and it took months of reaching out to tennis personalities (including former players) before the authorities in South Africa even did any investigations. Recently, after Ilie Nastase made his racist remarks about the colour of Serena’s baby, Pam Shriver spoke about how Nastase had wanted to know if she was still a virgin. I wondered recently when tennis would have its own MeToo and TimesUp moment. Surely no one thinks that many of these young men and women who have had to leave their families, some from very poor circumstances to go to training academies, where sometimes they don’t even speak enough English, and wonder if some ne’er do well coach has not used the opportunity to play fast and loose. Tennis, being the insular, incestuous, secretive sport that it is, I doubt if we will ever hear of anything like this happening, in the same way that USA Gymnastics is about to have its own moment of reckoning. As will be the case a lot of people will say that these things do not happen, but if you have not already done so, you can read Jelena Dokic’s book or read about Mirjana Lucic-Baroni and know that while these instances of abuse were happening, no tennis journalist covering the sport at the time, or indeed any players came out in defence of any of these women. In the same way, if these things are happening at academies, no one will ever speak out against it, because that is how tennis works. Clearly, tennis now needs its own #MeToo and #TimesUp moment. Kanepi v. Suarez-Navarro (Kanepi is one of my favourite players to watch. Hits cleanly and crisply. If you can just listen to the sound that the ball makes coming off her racquet. Suarez-Navarro has been playing well, but don’t know if she has what it takes to take down Kanepi. It must hard to be Serena Williams. I imagine it must be even harder to be Venus Williams. Venus was the first of the Williams Sisters to make a Grand Slam final. She was the first to join the WTA Tour. She was the first to play with beads in her hair. She was the first to hit a swing volley. She was the first with a serve that was clocked the fastest in the world ever hit by a woman. There is a lot of firsts for Venus. This year she was the first top seed to lose at the Australian Open. I am sure that is not something that Venus would like to herald from the mountaintop. The player who took her down in straight sets, went out in the same way to unheralded Kumkhum, a qualifer from Thailand. Most of us first became aware of Kumkhum when she took out Petra Kvitova in the first round of the US Open some years ago. When Bencic took the court at Rod Laver arena to play Venus she brought the holdover swagger from winning the Hopman Cup. She had confidence and she let Venus know that despite the age difference and despite the fact that Venus was a top player, she was here not only to play but play to win. And she did just that. I watched Bencic’s match against Kumkhum from start to finish. I expected her to pull a rabbit out of a hat, especially on her break chances. I expected her to win those long deuce games. I expected her to use her power and guile against Kumkhum in the same way she did against Venus. Instead, what I saw was the petulant, entitled Bencic who clearly needed someone to come down court side and hold her hand. I sometimes do not wish to use the narrative that players play their best against Venus and Serena, but after watching last night’s performance, there is no other way to spin what can only be termed a disastrous showing by Bencic. I went to bed during the second set of Wozniacki’s match against Fett. I woke up this morning to hear that Wozniacki came back from 5-1 and 2 match points to beat Fett 7-5 in the third. I have not seen the third set, but no doubt I will try and take the opportunity to see what happened. It was my first time seeing or even hearing about Fett, and apart from her unusual service toss which always makes me think she is going to double fault, there is a lot to like about her game. In another match that finished very late Australia time, Gavrilova, up 5-0 in the first set, would go on to lose that set 7-5 to the always dangerous Elise Mertens and then end up losing the match in straight sets. I don’t know what Gavrilova needs to take her game to the next level, but bouncing around the court and trying to get the home crowd on her side against her opponent is not it. Day 2 is now done and dusted. The final match of the ladies first round saw a really good match between Barty and Sabalenka. The match showcased the raw talent that is Sabalenka who mixed it up quite nicely, coming in at every opportunity. It also showcased a player that I really enjoy watching, and that is Ashleigh Barty. Composed and skilled, Barty showed us why the great Justine Henin took her under her wing a few years ago in an effort to develop her talent. It is great to see her back on Tour and playing with such panache. I barely watched any matches last night and it makes no sense to DVR the matches that happen overnight simply because ESPN prefers to showcase men’s matches and if they do feature women’s matches, it is usually some “marquee” name that I have no interest in watching. Last night was no different as the featured match once ESPN came on air was Sharapova v. Maria. Clearly this caused social media to go all in on the fact that Sharapova was playing herself, a fact many people found quite funny. Chris Fowler and Chris Evert had the call and prior to my switching to something else, the consensus from Chris Fowler was that it was a poor look for tennis to actually have someone returning from a doping violation, a doping violation that was incurred at this event 2 years ago, to take part in the draw ceremony. He felt that it sent the wrong message. Chris Evert, ever the wannabe peacemaker opined that Sharapova had served her suspension. Fowler took the view that it was not a good look for the sport. He further went on to mention how tepid the response was by the fans in the stands when Sharapova was announced. Fans, despite what people might think are not being lead as sheep to slaughter. Day 2 matches had little or no surprises. There wasn’t any match that stuck out to me. Petra Kvitova lost to Andrea Petkovic in what must have either been an error filled match or some clean ball striking. I have not yet had the opportunity to watch the match on replay. It wouldn’t be a Slam if some idiot didn’t call out the women’s game for grunting. This time around it is Todd Woodbridge, bygone doubles player from an era when tennis wasn’t even on tv. Mr. Woodbridge, during the match against Aussie Ashleigh Barty and Belarussian Sabalenko, tweeted that until the women stop grunting perhaps the time has come for their matches not to be shown (or words to that effect). In effect, he felt that the grunting was reason enough for tv to switch from showcasing a match featuring two talented women. I know I say it all the time and I suspect I will have to keep saying it but tennis needs more women at the top of the sport where it counts. We need more women in the commentary booth who are willing to call out the sexism when it happens in our sport. Rather than enjoying the spectacle (which made me late for work), Mr. Woodbridge felt that the women (even one of his own) should be punished because someone was grunting during a match. I suspect that Mr. Woodbridge will next be calling for the dismissal of the tournament announcer who felt it was his duty to mock Ms. Barty’s opponent after the end of the first set. Continue being you tennis. Continue being you. These are the words that let tennis fans know that a match is about to start. For Venus Williams, she was like most of us who hear the alarm clock, decide to hit it and say just one minute more please. There is no doubt that Venus’ first round opponent, Swiss Miss Belinda Bencic was on her game. We saw that during her Hopman Cup matches. Her net game was much improved. she was fitter than before she had her injury layoff but what impressed a lot of people was her return of serve. Prior to her injury layoff, Bencic would routinely lose matches and one key stat was her inability to return serve. One cannot forget her suffering through 15 aces by Sharapova at the Australian Open in 2016. Venus on the other hand could not get a read on Bencic’s serve. She had multiple break point opportunities to get even in the first set and while most of those opportunities had to do with Bencic serving her way out of trouble, it also had to do with Venus’ sluggishness. Last year another great champion got taken to task for skipping the whole clay season to focus on the grass season. This was a decision that paid off in the end as Federer ended up winning Wimbledon. Perhaps the time has come for Venus to start scheduling smarter. I am sure that Serena was quite upset about not being able to defend her title here this year but she took the view that it was better that she return when she is able to compete effectively rather than just seeking to defend points. Venus needs to take that same view. The Australian Open is a tournament at which Venus has had some shocking losses. She has made the finals twice in her long and storied career and frankly I would not miss her if she never played it again. I think Venus and her team need to take the long view when it comes to her schedule. She is not a young player. She has health issues and in my honest opinion, if Venus expects to win big tournaments or any tournament she needs to schedule better. If that means dropping tournaments that are too close to the end of the season or too close to the start of the season then she needs to drop them. I believe she should start her season in the spring by playing smaller tournaments to get match fit. They kept dropping like flies. Sloane, Venus, Coco, Falconi, Kenin, and Townsend. The men were not to be left out as both Jack Sock and John Isner were both sent packing (MAGA). Even Ryan Harrison barely made it through as Dudi Sela served for the match, but failed to do so. Sloane Stephens has not won a match since winning at the US Open last season. In her match against Zhang, Stephens served for the match at 5-4 in the second set but would go on to lose the set in a tiebreak, get broken early in the third set and seemed to tire at the end. Reduced to chasing balls and being pulled from side to side, Stephens would try drop shots that did not make their over the net, and the constant looking at her coach for guidance became the hallmark of the rest of the match. As someone else has opined elsewhere, the worst thing to ever happen to Sloane Stephens was winning the US Open. It is a travesty that similar to Kim Clijsters who returned to the Tour in 2009 rested and refreshed only to win the US Open that year, Stephens returned to the WTA Tour, recovering from a knee injury and returned refreshed and renewed. Usually, I never write about these things because I find it quite tiring but I have to register my disgust with the Australian Open App. It does not work. No live scoring. No results. No schedule. Nothing. Nada. Zip. Millions of dollars have been spent. A draw ceremony that left a bad taste in everyone’s mouth. Maybe the Australian Open has lost its way. Hopefully, the same amount of effort that went into getting Sharapova to stand there and smile and answer questions about “returning” to the Tour will be made into getting an app that actually does what it is supposed to do.